PITTSBURGH, PA – (February 23, 2016) – First Insight, the world’s leading provider of solutions that empower brands to incorporate the voice of the customer into the design and merchandising of new products, announced today that it was recognized in Gartner’s 2016 Market Guide for Unified Price, Promotion and Markdown Optimization Applications. The report was written by Robert Hetu, Retail Industry Services Research Director and published on February 22, 2016. 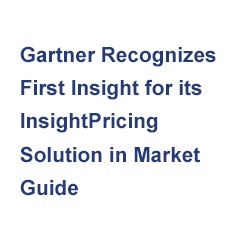 In the report, First Insight was listed among the representative vendors, and Gartner reviewed the InsightPricing solution. “Gartner’s report highlights the rapidly changing solutions available to the retail industry. First Insight is proud to be recognized as one of the Representative Vendors and believe we are at the forefront of these solutions, offering products that have the potential to revolutionize the industry,” said First Insight President and CEO Greg Petro.